I don’t know how many of you played a musical instrument but I played the piano and saxophone. 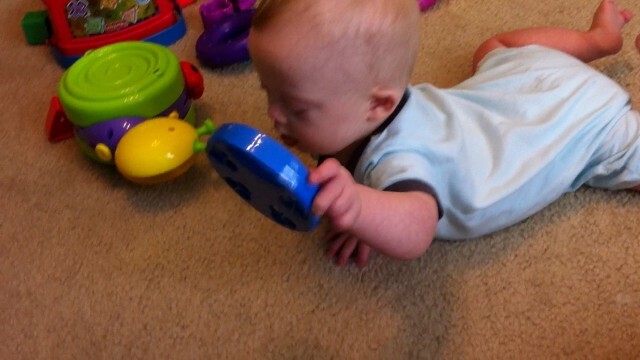 I was much more talented in the musical department than I was in sports, so if Noah isn’t good at sports it has nothing to do with Down syndrome ….but possibly everything to do with his mother. I however, thought that basketball was way cooler than the piano, so at 15 I decided it was time to focus on basketball after 9 years of piano lessons! I went on to quit the basketball team my senior year as I had better things to do then sit on a bench of a coach who didn’t really think I had game. It was one of the hardest things I did as I had never quit anything in my life, but it was the right decision. Can I still play the piano, yes, but who knows what I would have gone on to achieve had I stuck to what I was good at. Noah likes to rock the tambourine. My piano teacher believed firmly that music connected both sides of the brain. The right side of your brain thought to be creative, artistic and musical; and the left to be speech, comprehension, math, and writing. There are several benefits of music for children with learning disabilities, but I am going to touch on just one today as I promise you this is not Noah’s last exposure to a musical instrument and more will come. The tambourine also makes for a nice snack! There have been a few studies out of Hong Kong that focus on music’s effect on learning. One study showed that individuals who had musical training tended to have an enlarged left temporal lobe. I thought this a bit weird considering music is supposed to be on the right side of the brain. There are studies that show that as your musical experience increases it shifts from the right to left side of the brain. The left temporal lobe has a lot to do with speech and verbal memory. As you can probably guess, those with musical training have been shown to have improved verbal memory than those without. Once musical training is stopped the improvement in verbal memory also stopped, they still remained above those without any training, but they did not continue to progress as those still involved. I think this can help us understand why music helps us learn verbally, and why songs get stuck in our head rather than the last book chapter we read. Noah loves to make music. He will pound on keyboards, drums, shake maracas and jam with the tambourine. I think the tambourine may be one of his favorites. What ways do you incorporate music with your child? What benefits have you seen? Thanks so much for the kind words.Do you work with any children with Down syndrome in your practice? I never thought about singing directives, that is brilliant!! This is one of the things parents come back to me and say, that their child will put things away at home when they do the song from Kindermusik class. Listening to music stimulates more areas of the brain than any other activity! So when you sing instead of speak, children light up and ‘listen’ because their brain is functioning at its optimum level. Thanks for sharing that Brenda! By the way, do you teach music therapy? The best and earliest example of this I can think of is the clean-up song! My son grasped what it meant when I sang that LONG before he could follow instructions, and while he still isn’t great at actually cleaning up in a meaningful way, he “helps” when the first notes of the song are sung, at 2. My 3-yr-old responds MUCH better when I sing something to him. He’s even taken to singing his thoughts to me, too! James LOVES music! But he didn’t really respond to it until the last month or two. But now he really gets going. 🙂 We like to play lots of children’s songs in our house. I sing to him when I change his diaper. And the funniest is that our music-buff PT just figured out that James loves techno music! As far as interactive music, James likes to swipe a drum of his big brother’s. And his glo-worm has become a favorite nighttime toy. Sometime in the wee hours of the morning this morning, I heard the little glo-worm just a goin’. I guess there’s a reason those glo-worms have been around forever! 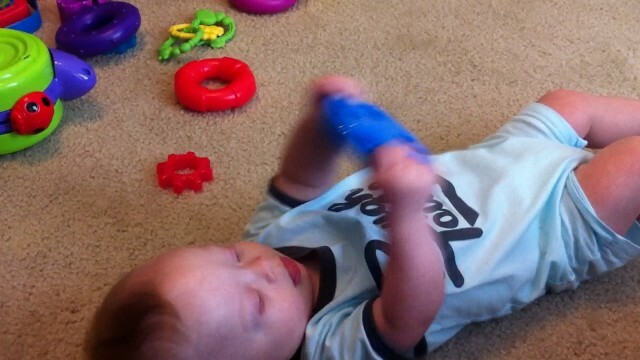 It’s so cool now that James has really figured out that pressing the toy leads to more music. He’d almost “gotten it” awhile back, but then the batteries died, and then he had something just short of the plague (okay, might have been conjunctivitis, but still), and I had to wash everything, find new batteries….well, it was awhile before he got it back! I’ve noticed that sometimes giving him breaks like that (same with trying new food textures) seems to help him over the hump when we try again! My dream would be for every child with Down syndrome to have access to music therapy! That was a great blog post! I like the idea of color-coding the music. How do you get music therapy for your son? Does insurance pay for it? Thanks!!! Wade is getting his music therapy through our local public school system. I requested that it be put into his IEP. It took a while to get everything in place, but I’m so pleased with the results! Oops, I forgot to say that some insurance companies do pay for music therapy now. Another alternative might be to request it from your early intervention program. I’m trying out a new comment system, and I had a quick question for you; did you receive a notification (email) of some sort when you received a reply to your first comment (and this one I’m leaving for you now?) I’m trying to make sure people are receiving notifications. Yes, Rick, I received an email notification of the reply. Hope you have success in finding a music therapist! I just checked in here, and it turns out I forgot to subscribe, so I had some catching up. But–without the subscription–I did NOT get notification of replies to my posts. Just an fyi. Abbie–Some insurance covers Neurologic Music Therapy, but it depends on your carrier. Like Karen said, many EI programs have music therapy, but often you have to go on your own to find a music therapist. By the time he’s 3, and in the public school system, it CAN be added to his IEP…just make sure that he’s evaluated by a certified music therapist. If you are interested in finding a music therapist now in your area, contact the American Music Therapy Association at 301-589-3300. They can give you a listing of music therapists in your area who work with young children. That’s great to know. Thanks for sharing, we are going to have to look in to that for sure! You’re welcome!! If you decide to go the insurance route, please let me know how it goes! It isn’t always easy to get them to cover it, and we’re working on making music therapy more accessible to families in terms of expense. You might need to try more than once–sometimes they deny things like this the first time, but if you can justify the need (letter from his ped, and a music therapist evaluation) , many times they will agree in the end. Blessings!!! Ditto to what MaryBeth said (hi, friend! ), but it doesn’t have to be Neurologic Music Therapy to get it covered by insurance. I did initial training in NMT, but did not maintain that credential, but we are getting insurance reimbursement for music therapy for several clients. To find a music therapist in your area, you can go to the American Music Therapy Association’s website at http://www.musictherapy.org, or the Certification Board for Music Therapy, http://www.cbmt.org, to search for a music therapist in your area. And yes, we are starting to get insurance reimbursement for music therapy services – it’s a case-by-case basis and really depends on your plan, but definitely something to look into. There are so many ways that music can help kids with Down syndrome and other disabilities! I am in complete agreement with all of the other commenters, but I speak as a parent and not as a professional. Music is HUGE in our household. We sing all the time, even the simplest of commands (ie. “Ellie, put blocks in the bucket”. and “Ellie close the drawer”) and guess what, Ellie typically obeys 😉 I started Ellie in a Music Together class early on and she loved it. We have played the songs so much that she recognizes her favorites and mimics the hand movements performed during class. Now, we do a music therapy class which I believe has helped Ellie’s communication. Ellie is now signing more signs and making more sounds! I am going to have to look at this music together stuff, it sounds great! You guys are always rocking it! I also enjoy hearing all the great things you guys are doing. I love Music Together! I’ve had kids with Down syndrome in my class, and they have so much fun. http://Www.musictogether.com has a class finder where you can look for classes in your areas. Classes are mixed-age classes, so they are the perfect avenue for inclusion of kids with special needs. That is awesome! Glad she is doing awesome. @Karen: That would be my dream too! Landon loves music.He likes to dance and sing..Yes sing,I can not understand him but he knows what he is singing!!! Music is great for him..
That’s awesome, and so does Noah. Lotion on my legs, lotion on my feet, hey mommy mommy that really feels neat. Lotion on my chest, lotion on my belly, hey mommy mommy that really feels funny. Lotion on my arms, lotion on my hands, hey mommy mommy that really feels grand. This was an awesome post. I learned so much. Thank you. Thanks, my wife really did a great job on it. Do you guys do any musical type of ‘stuff’ in your house? Do you guys do any musical type ‘stuff’ in your house? Couldn’t agree more! The benefits or music are too many to count! Many blessings to your family!!! Thanks also for the kind words about Noah, we really appreciate it. What sort of work do you do with children with special needs by the way? Yes Abbie, I did read your comments about the piano and basketball. I loved watching you on the court as well as playing the piano. However, the coolest thing of all is watching you with Noah. 🙂 thanks mom. Love you too. My son has a brain injury that occurred when he was 12 days old. When he was just beginning to sit up I noticed that he would bounce his body to the rhythm of the chopper as I chopped onions. He has always loved music. He is turning 7 on Thursday, and he continues to love music. He has a guitar and drumsticks, but has struggled with concentrating long enough to move forward with any lessons. Perhaps in the future. I have noticed that if you put something to a song or a poem he will remember, despite his struggle with retaining information. Though, we are finding that he can learn Scripture pretty quickly. I attribute that to the power of the Word. Thank you for sharing. If you have any thoughts on an at-home music exposure program, I would love to hear. Thanks for sharing. Your son sounds like an amazing boy! What’s his name, if you don’t mind me asking? I teach guitar and just so you know age 7 is a bit early for guitar. I used to teach that age and found if frustrating for me as well as the child. They dont seem to have the grip strength for pressing down the strings as well as the maturity to remember. So I would say yes try again at age 8 or older. A music program would be benificial. I teach Afterschool music clubs in my area in Wisconsin. Maybe you can find something like that. My special needs son suffered brain damage many years ago and we noticed that music helped him remember things and re-learn to talk. He knows the lyrics to nearly every song he’s ever heard. Learning things in sing-song helps him to focus and remember. I’m glad that so much more is known about the power of music today, it is a remarkable tool. Wow, thanks for sharing! How old is your son? AT 5 1/2 months Enzo began his “MUSIC TOGETHER IN THE KEYS CLASS”. You can check it out at http://www.musictogetherinthekeys.com or go to the main website and find a class near you in Texas. www.musictogether.com (I think that is the website). People also do a class called kindermusik, but I don’t know what that is like. The class Enzo takes is very informative, tells us how different types of tempos, songs, etc. teach children so much. We love it. And let me tell you guys…Enzo’s facial expressions during a class or to die for! There are no words to express just how much joy these classes bring him. I hope you get to try it out. What do the parents do the entire time? I’m assuming just sort of hang out and play with them like library story time? Do you ever see any dads there? When it comes to MUSIC TOGETHER IN THE KEYS the parents come into the room with the children. In fact, what the parent does is what the basis of the class is about. It’s basically the fact that the child will follow what the parent does. So….basically we sit down with Enzo and start with the Hello Song. Enzo is sitting right in front of us and we sing with everyone else. The older children will sing along, slapping their hands on the ground with us, but Enzo, since he doesn’t do that yet, just watches. His eyes are big and round and you can see that he wants to join in! He truly wants to do what we do. Then we sing another song. We learn about tones, different sounds. WE play with instruments, kitchen utensils, scarfs and even a colorful parachute (which is Enzo’s favorite). They take songs and sing them in different ways to show how everyone can make a song personal or more fun. Sometimes the CD is used, but most of the time it’s all about using your imagination and your own voice. The children love it! Enzo loves it! I highly recommend you do this for Noah! There is no better feeling then the look of awe in Enzo’s eyes. Something is definitely making him learn! Thank you for sharing your thoughts and childs life with the world. I teach preschool music including one class of children with Downs Syndrome. Music is wonderful for language and memory. I see all the time the development from week 1 to the last. They will sing along and participate more and more. Its all about the three R’s. Rhythm, Rhyme and Repetition. Keep on singing and playing music! They are learning even when you think they are not paying attention. Super interesting. We don’t have a DS baby, but we adopted a little girl with a serious uncorrected CHD. She was 3 when we met and grew to that age with low O2 sats and a less than optimal environment. Most of her struggles are in the language areas. I can see that music training may be a big tool in helping her advance.